We are still working hard on our updated web-site - we thank you all for your continued patience & support. Ed's Coffee House. Your local drinks specialist. We are constantly adding new flavours and blends to our extensive range of coffee's, tea's and drinks. Come and talk to our educated staff today and let us help you find your perfect brew. 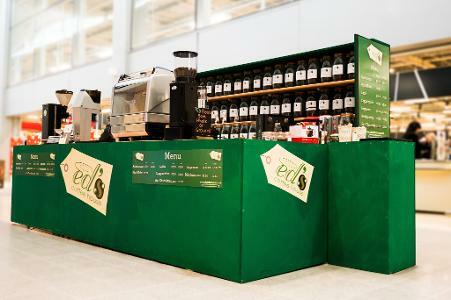 Welcome to Ed's, where you will find a huge selection of regional and flavoured coffee beans as well as some instant coffees, loose leaf teas and all things drink related. We aim to meet the individual needs of coffee lovers everywhere, making each encounter a personal one, listening to our customer's preferences and suggesting drinks that would best suit their taste. The business came into being because we all had a real passion for coffee and it's many flavours, strengths and unique attributes. We had trouble sourcing the variety of coffees we wanted in small enough quantities to use at home so we developed the idea that eventually turned into the business it is today. At Ed's Coffee House you select the coffee you want and purchase as little as 100g to take home. We are able to help and advise our customers so that they can make an informed decision about their purchase, tailoring to their individual requirements. We stock coffees from Kenya, Brazil, Columbia, Ethiopia, Guatemala, Costa Rica, Indonesia and many more including our flavoured coffees including the popular Irish Cream, French Vanilla, Maple Walnut, Rum, Amaretto and Christmas (seasonally).We also stock instant coffees, brewing equipment. loose leaf teas and hot chocolates. You can purchase your coffee in whole beans, or we grind them to match your brewing equipment, if you don't have any brewing equipment we even stock items such as the french press, areopress, continental drip filter, tea balls & grinders. If you have tried a coffee that you like and you have been unable to find it elsewhere then come along to Ed's Coffee House and we will do our best to source it for you. Come and visit us at our stall today on Coventry Indoor Market, close to the Lower Precinct entrance, We look forward to meeting you soon.